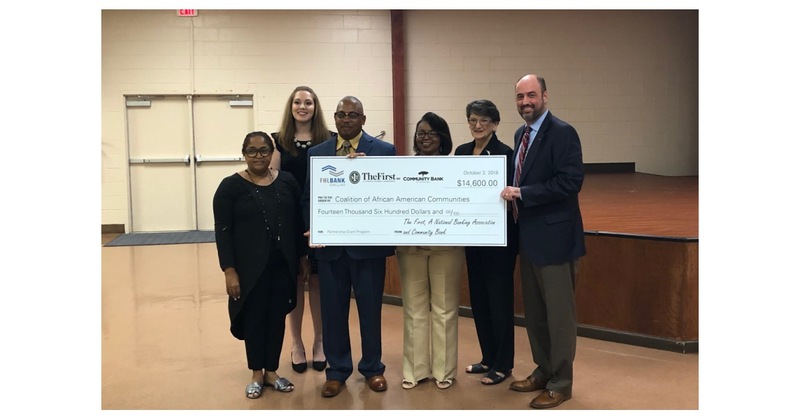 GULFPORT, Miss.–(BUSINESS WIRE)–A $14,600 Partnership Grant Program (PGP) award from The First, A National Banking Association (The First), Community Bank and the Federal Home Loan Bank of Dallas (FHLB Dallas) will help the Coalition of African American Communities (COAAC) to expand its programs to reach more people by offsetting operational and administrative expenses related to business development classes and seminars. Local dignitaries joined bank and project representatives today to award the funds to the organization at a check presentation. The mission of the organization is to strengthen relationships between residents and local financial institutions and help create sustainable communities through stimulating small business development, education, training and homeownership workshops. Established as The Amos Network following Hurricane Katrina, the nonprofit changed its name in 2014, as well as shifted its focus to financial literacy and small business training for low-income residents. “We work to build relationships between the community and the banks. I act as a sort of liaison, and I’ve been able to identify some voids in those relationships,” said Anthony Thompson, executive director of COAAC. Community Bank Senior Vice President Harry Piascik said the partnership aspect of the PGP is valuable for community engagement. Through the PGP, FHLB Dallas member institutions contribute $500 up to $4,000 to a community-based organization (CBO), which FHLB Dallas matches at a 3:1 ratio to provide the CBO up to $12,000 in grant money. In 2018, FHLB Dallas has awarded $300,000 in PGP funds through 31 member institutions to assist 32 community-based organizations. Combined with the $114,010 contributed by FHLB Dallas members, a total of $414,010 has been awarded to the organizations. “Through a collective spirit of commitment and partnership, our members are positively impacting the communities in which they live and serve by participating in programs such as the PGP,” said Greg Hettrick, first vice president and director of Community Investment at FHLB Dallas. The First, A National Banking Association, headquartered in Hattiesburg, Mississippi, began as a dream on a back porch in South Mississippi. A group of local businessmen talked about creating a bank that would take care of business by taking care of people one customer at a time… and The First was born. Now, that dream has grown from a back porch to cities and towns all over South Mississippi, South Alabama, and Louisiana. The First is more than a bank…because it is still a group of friends building relationships and taking care of business one customer at a time! The First currently has 62 locations and assets exceeding $2.5 billion. Community Bank, a $2.9 billion-dollar bank, headquartered in Mississippi, has 47 offices in four states – Mississippi, Alabama, Tennessee, and Florida, with eight of those being on the Mississippi Gulf Coast. With over 730 staff-owners, Community Bank takes pride in offering cutting-edge products and services from checking accounts and an in-house mortgage department to a full suite of business products. For more information, visit, communitybank.net.